Yesterday was our final Tuesday night My First Fondo clinic. It was bittersweet to see our 14 week training program come to an end, but it’s been incredibly worthwhile and puts a cap on all the hard work leading up to September 7’s Gran Fondo Whistler. From nutrition talks, to physio and stretching, to bike maintenance and fixing flat tires, to group riding practice, signalling… Amazing skills and camaraderie were developed with fellow newbies. The value of the program became obvious when I rode West Van to Squamish last weekend, in that it was a vastly easier ride than I had anticipated. Hard Work Pays Off! I am SO fired up for the Gran Fondo now, it’s hard to describe. Let’s get it on! Ride details: I did an extra lap around UBC since I arrived at our group meeting point 30 minutes early. Clinic route included 2x Spanish Bank (only one of which uploaded to Strava, leading me to believe that I forgot to restart my computer for a section of the ride). I arrived home just as it began showering and was getting dark. My heart rate monitor is off. It was showing low when I was going at a good rate, and then crazy high during quite average work… And there’s no way I was hitting 210 at any point. Wondering about the strap and if I’m wearing it properly. 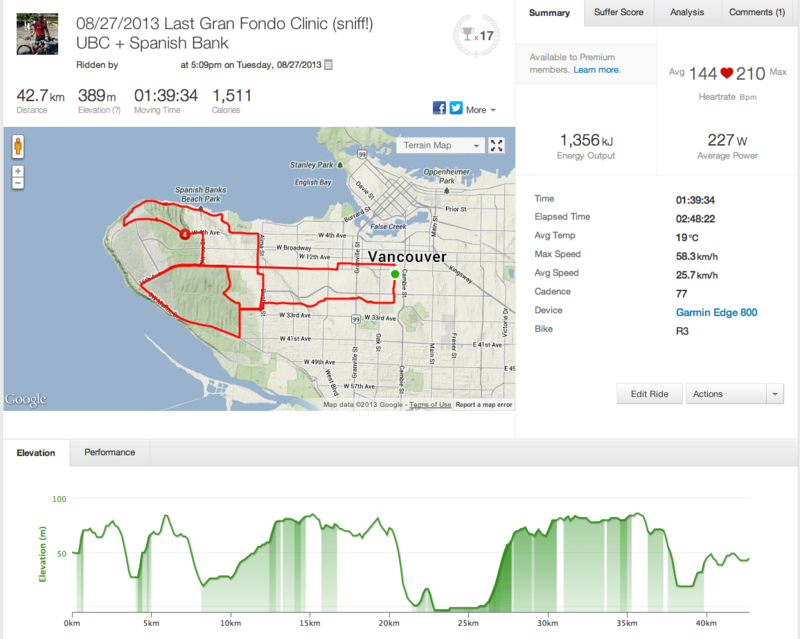 So long, farewell My First Fondo, it’s been a peach.